Founded in 1836, BCS is a perfect blend of picturesque landscapes, historic architecture and modern facilities. BCS is dedicated to providing students with a dynamic and challenging academic experience in an environment fostering personal growth and development. International students and staff live and work together; multiculturalism and international understanding are hallmarks of our campus community. BCS has a school-wide laptop programme and has incorporated this technology into teaching by all departments. 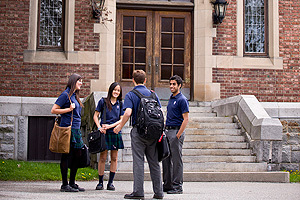 BCS grads are accepted at the most prestigious universities across North America and throughout the world.